Those humble organic brands are not what they seem. My first introduction to natural, organic and eco-friendly products stems back to the early ’90s, when I stumbled upon Burt’s Bees lip balm at an independently owned health food store in the heart of Westport, Kansas City, Mo. Before the eyesore invasion of ’98, when Starbucks frothed its way into the neighborhood, leading to its ultimate demise, Westport was the kind of ’hood I still yearn for. It was saturated with historically preserved, hip and funky, mom & pop-type establishments, delivering their goods people to people. I was surprised more recently when I saw Burt’s Bees products everywhere—in grocery stores, drug stores, corner bodegas and big-box stores like Target and Wal-Mart. I thought to myself, fantastic; the marketplace is working, and good for Burt. He has made his mark, and the demand for his products is on the rise. Needless to say, I was shocked when I recently found out that Burt’s Bees is now owned by Clorox, a massive corporate company that has historically cared very little about the environment, but whose main industry is directly associated with harmful chemicals, some of which require warning labels for legal sale. 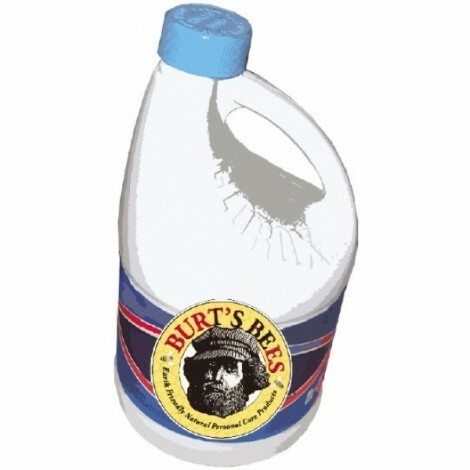 Clorox—yes, that’s right—the bleach company with an estimated revenue of $ 4.8 billion that employs nearly 7,600 workers (now bees) and sells products like Liquid-Plumr, Pine-Sol and Armor All, a far cry from the origins of Burt. I now understood. The reason Burt’s Bees products were everywhere was precisely because they now had a powerful corporation in the driver’s seat, with big marketing budgets and existing distribution systems. In the summer of 1984, Shavitz was driving down the road and spotted a hitchhiker who needed a lift to the post office. He pulled over and picked up Roxanne Quimbya 34-year-old woman who eventually became Shavitz’s lover and business partner. Quimby started helping him tend to the beehives, and that eventually led to the all natural-inspired health-care products made with Shavitz’s honey and the birth of Burt’s Bees products. However, Quimby and Shavitz’s relationship became “sticky” in the late ’90s, for reasons unclear, yet probably having little to do with honey. Their romantic break up carried over to the split of their business partnership as well. In 1999, Quimby bought out Shavitz’s shares of the company for a small six-figure sum. Quimby then continued, becoming phenomenally successfully and growing sales to $43.5 million by 2002. In 2003, a private equity firm, AEA investors, purchased 80 percent of Burt’s Bees from Quimby, with her retaining a 20 percent share and a seat on the board. In 2006, John Replogle, the former general manager of Unilever’s skin-care division became CEO and president of Burt’s Bees. The company was sold to Clorox in late October 2007 for $925 million. I began to wonder about the other products I liked, trusted and respected for their independence and their social responsibility. How many were really owned by big corporations, who were going out of their way to hide the link between the big corporate company with the small, socially responsible brand? It didn’t take long for my list of disappointments to grow and grow. Upon first meeting someone, I can usually tell quite a lot about them by the contents of their bathroom. The brand I see most often behind medicine cabinets of people I consider to be environmentally conscious is Tom’s of Maine. What Tom’s says to me about the person is that they are willing to spend a little bit of extra cash in order to take proactive steps to help green the Earth. Well, no more. My bathroom assessments will never be the same. Tom’s of Maine is owned by Colgate-Palmolive, a massive, tanklike company with an estimated 36,000 employees and revenue of approximately $11.4 billion. Its big products include Ajax, Anbesol and Speed Stick. “Let’s get to the bottom of this,” I said, aiming to check out all of the brands that I and countless other good consumers were buying in our efforts to support grass-roots business and not corporate behemoths. Little did I know how deep the hole was going to be, and in some cases, how hard to find out who owns what. In the dairy section sit many flavors of Stoneyfield Farm Yogurt. I knew its socially conscious CEO, Gary Hirshberg, had created major organic brand recognition to become the No. 1 seller of organic yogurt in the United States, but since then Danone, the French conglomerate (which also owns Brown Cow), acquired a majority holding in Stoneyfield. This is the same Danone that had to recall large quantities of its yogurt in 2007 after it was found to contain unsafe levels of dioxins. (In an interesting twist, the still-active Hirshberg sits on the board of Dannon USA. Unlike most of the early entrepreneurs, who took the dough and left the scene, Hirshberg is still involved. ) Meanwhile, I learned that Horizon Organic milk was bought out by the largest diary company in the United States, Dean Foods Co., in 2005. Next I ventured to the juice section. Drinking Odwalla juices was an expensive habit I had justified for years because of its healthy California brand. The ubiquitous refrigerators in thousands of stores should have given it away that Odwalla wasn’t the small company it once was. It is now owned by Coca-Cola. Almost as soon as Coca- Cola bought the company, back in 2001 for $181 million, it stopped selling the fresh-squeezed OJ that had made Odwalla famous and popular among the healthy set. With its massive distribution system, fresh squeezed wouldn’t last the days and weeks the juices are in transit or on the shelf. Not to be outdone (although it took it a while), Pepsi bought Naked Juice in 2006 for $450 million, in order to compete with Odwalla. Smuckers, the brand we are told is the “brand we can trust,” grabbed several juice mainstays from the health food store shelves: After the fall—R.W. Knudsen and Santa Cruz Organic.Turns out that Coca-Cola also owns Glaceau, the company once known for its “fresh new approach to bottled water that is inspired by nature and enhanced by science.” Glaceau is the maker of Vitamin Water, Fruit Water, Smart Water and Vitamin Energy—all bottled waters that are adorably marketed and loaded with sugar. It’s no wonder Coca-Cola was slapped with a lawsuit in 2006 for making deceptive and unsubstantiated health claims in its Vitamin Water marketing strategies; they are selling glorified sugar water. As for bottled water, egads! That’s a whole article in and of itself. The scourge of bottled water, of course, is an environmental disaster on many levels, as corporations have moved in to take control of local water supplies, while some of the same companies and their mega advertising budgets have created a giant market for bottled water, with enormous waste from plastic bottles and giant carbon foot prints as water is shipped over many thousands of miles from Fiji for example, or Italy, when pretty much no bottled water is needed. Frequently, tap water is of higher quality and more closely tested than bottled water. Over in the breakfast aisle, my friend became apoplectic when we learned that the “super healthy” Kashi cereals, the favorites of millions of healthy breakfast eaters, was bought in July 2000 for an “undisclosed sum” by Kellogg’s, the 12th-largest company in North American food sales, according to Food Processing. I picked up a box of Kashi’s “Go Lean Crunch” and searched every word; not one mention of the fact that Kellogg’s owns them. That change was really below the radar. “Cereals, like milk, are one of the primary entrance points for use of organics,” said Lara Christenson of Spins, a market research group for the natural products industry, “which is pretty closely tied to children—health concerns, keeping pesticides, especially antibiotics, out of the diets of children. These corporate connections are often kept quiet. “There is frequently a backlash when a big cereal package-goods company buys a natural or organic company,” Christenson said. “I don’t want to say it’s manipulative, but consumers are led to believe these brands are pure, natural or organic brands. It’s very purposely done.” A little more digging shows that General Mills owns Cascadian Farm; Barbara’s Bakery is owned by Weetabix, the leading British cereal company, which is owned by a private investment firm in England; Mother’s makes it clear that it is owned by Quaker Oats (which is owned by PepsiCo); Health Valley and Arrowhead Mills are owned by Hain Celestial Group, a natural food company traded on the NASDAQ, with H.J. Heinz owning 16 percent of that company. After the Kashi news, I wondered what was next? I didn’t have to go any farther than the organic chocolate aisle of my favorite deli to find Green and Black’s organic chocolate was taken over in 2005 by Schweppes, the 10th-largest company in North American packagedfood sales. And even more surprising to chocolate lovers is that Dagoba Chocolate, which had a little cult chocolate following for a while, is—surprise, surprise— owned by Hershey Foods. There seems to be an apt analogy between the huge growth in the “naturalization” of packaged goods in grocery stores and supermarket aisles and the massive transformation of organic fresh foods. Organic farming began as a grass-roots movement to produce food that was healthier and better for the land. But it is now a huge, $20 billion industry, increasingly dominated by large agribusiness companies. said Ronnie Cummins, national director of the Organic Consumers Association. Some think that socially responsible business sellers don’t lose it all when selling out. Both Craig Sams from Green and Black chocolate and the late Anita Roddick from the Body Shop— which was sold to L’Oreal/Nestle, one of the most vilified of multinational companies—have said that they believe that an acquired ethical company can influence its new parent to improve its corporate behavior. Corporate marketing campaigns have been fooling us to trust that the niche brands continue to be small, environmentally conscious businesses that combine ecologically sound practices with a political agenda to put products out on the market under a business model of “the Greater Good.” In fact, they are frequently cogs in the giant corporate wheel. I like to refer to this “other” business model as “We’ve Been Had.” It is time for us, the consumers, to question how much the ownership and neglectful marketing of these “pseudo” responsible brands warrant crossing them off our shopping list. And it is time to find products more in tune with our values, which include thinking small. At least until they, too, get bought out by some large conglomerate. Andrea Whitfill is a freelance writer residing in Brooklyn, N.Y. Her story originally appeared on Alternet.org on March 17, 2009.